Just presented at the Italian Contemporary Film Festival in Toronto, right after a successful screening at the Short Film Corner in Cannes, L'Amore Corto, a short film by Valentina Vincenzini, is an Italian-New Yorker project brought to life, thanks to the contribution of some of the Big Apple's greatest Italian restaurants (Numero 28, I Trulli, Sfilatino, Ribalta and Fabbrica), by a crew of young Italian professionals living in New York. Produced by Jack Boar Pictures and supported by Casa Italiana Zerilli Marimò, L'amore Corto tells the story of Giulia and Lorenzo, the two characters brought to life by Nicole Cimino and Iacopo Rampini, who have moved to the City hoping to live in a feature length film but they are trapped in an independent and low budget short. Valentina Vincenzini, lived in New York for eight months back in 2013. That's when the film was shot. She now lives in Rome and works as Creative Producer for the communication agency Save the Cut. This is what she had to say about the film. How did you get the idea of L'Amore Corto? I had the idea “L’Amore Corto” as I was riding the New York City subway. I would observe the people around me, people who spent their commute watching videos on their cell phones. That made me think of turning things around and come up with the story of two characters who would love to live in a feature length film but who actually live in a short youtube video with the consequential anxiety of the timeline that constantly marks the remaining minutes. I thought this was the perfect way to describe what so many kids who move to New York feel. They get here with great dreams but they end up having to reappraise their expectations, while, day by day, the expiration date of their visa is getting closer. The independent cinema told by the two protagonists therefore becomes a metaphor of the condition of our generation, adults in their twenties and thirties, who have grown up thinking they'd “make a film just like the one or parents made,” but the end up finding themselves in a completely different context. They have no certainties and their future has to be completely reinvented. What are the challenges of telling the story you had in mind in only a few minutes of film? In this case, telling a short story in only a few minutes was not my biggest challenge. As the title reveals, Giulia and Lorenzo's story is deliberately short. The biggest challenge though was to come up with a good product with meager resources. Out budget was limited so each cost had to be optimized. At the moment of shooting the entire crew found they were actually living the situation I was describing in the film! Giulia and Lorenzo are racing against time, and it was the same for us. We ended up shooting all scense in only a day and a half, despite the rain and several other issues. How difficult is it for Italian filmmakers to make films in a foreign country, in this case in NYC? Paradoxically, I believe that for an Italian filmmaker it is now easier to shoot abroad rather then in Italy. New York specifically offers more opportunities to all independent filmmakers: whoever has a project and wants to make it come to fruition won't have a hard time finding great professionals, locations, tools and so forth. They just need to take their job seriously and work hard. In Italy, where there is a lack of a strong market for independent filmmaking, both short and feature length independent films are seen as a hobby, just something to pass time, so there are very few professional opportunities. I think that in Italy there is no lack of talent, but there is a lack of “the right conditions” that facilitate production. My personal experience with L’Amore Corto is indeed emblematic: in just five months I was able to turn my project into a reality. Everybody who worked with me is Italian, the only difference is that we all were Italians living in New York. No, I don't think so. When Giulia tells Lorenzo that they are “the next Italian losers who end up doing only independent shorts” she is just scared to play the game. She would love to live in a feature film, but she pushes him away because she is afraid of failure. Her frustration is the frustration of many young Italian professionals who are forced to leave their country because there are no other alternatives... but at times even abroad her talent is unrecognized. Obviously, that line, as well as the rest of the dialogue is strongly autoironic, considering that at the moment all of us were Italian professionals in New York shooting an independent short. How did you chose to convey your message in a romantic comedy format? The idea to use the romantic comedy genre to tell a meta-cinematographic story was an obvious choice. There was no better way to tell my story, a metaphor of contemporary life as the love story of two young Italians in New York. What's next for L'Amore Corto, and how important is it to be in all these festivals? As of now L’Amore Corto has been in over 50 film festivals, in 8 different countries. Thousands of people have seen it and this certainly is both a great achievement and an opportunity to compare our work with that of others. I believe that, film festivals are a must, especially for independent shorts. Unfortunately competition is very high and it is not always easy to be among the select few. For a filmmaker, festivals also are an opportunity to meet their audience and other professionals in the same field. Winning an award selected by the jury or by the audience is vital recognition; it means you have worked well, you are appreciated and encouraged to continue down that path. 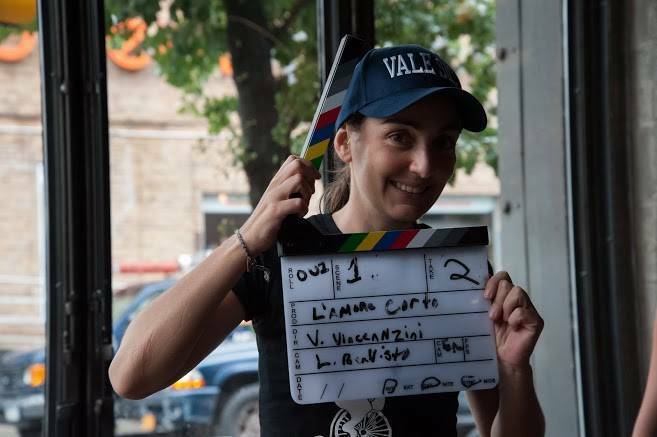 After the festival circuit, L’Amore Corto will end up on the web. Online distribution is on a global scale, it reaches a wider audience and more diversified audience that the film festivals. It's all about exposure.